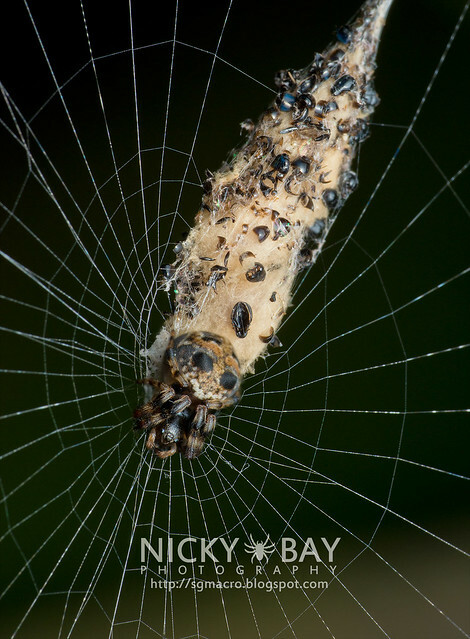 Cyclosa is a genus of spiders commonly known as trashline orb web spiders that tend to collect detritus and decorate them on its web. 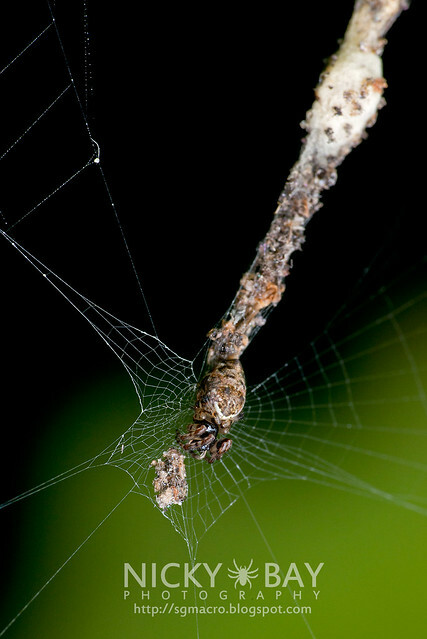 This detritus could be made from carcasses of their prey, exoskeletons of their prior moults, or even bits of leaves or rubble that land on the spider's web. 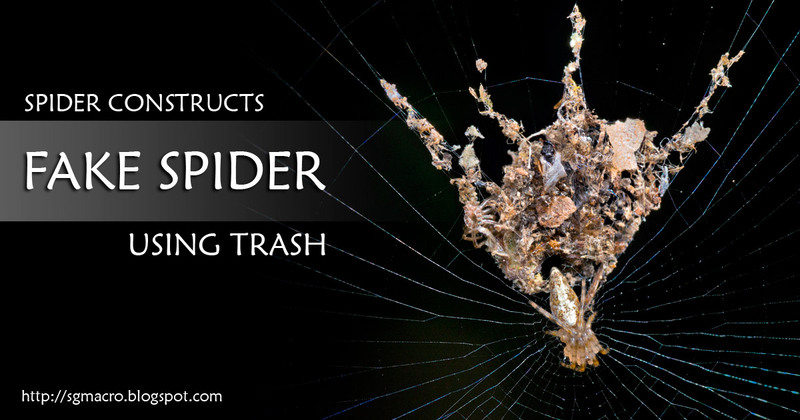 Usually, the "trashline" of detritus is built vertically from the center of the web. 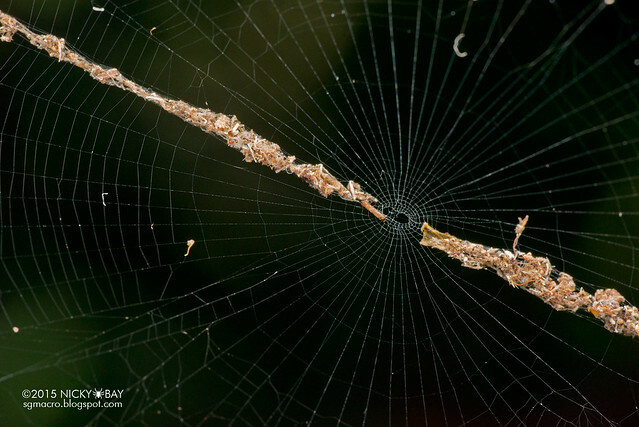 However, there are circumstances where multiple trashlines are built, radiating from the spider's orb web. 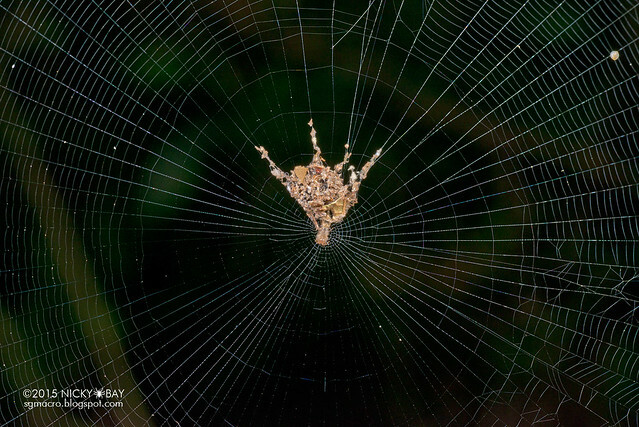 More detritus is collected near to the center of the web, and what results could very well be a spider-shaped decoy. This topic had been published extensively over the past 3 years when some specimens of Cyclosa in Peru were observed to be building trashlines in multiple directions and had the topic revisited again last year with further studies and observations. 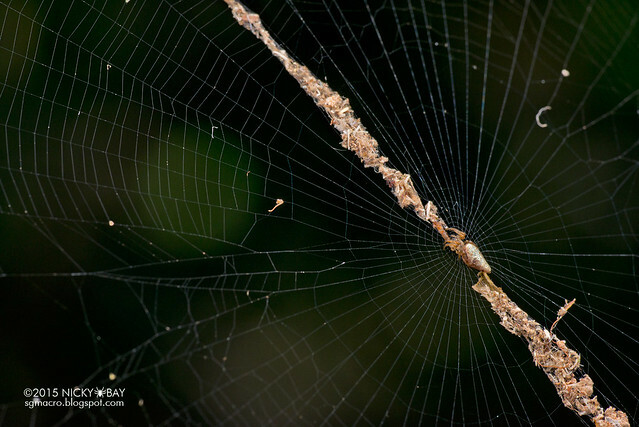 These spiders are actually very common, and we do not need to visit the Peruvian jungles to witness such spidery artistry when it exists right in our own home, Singapore. 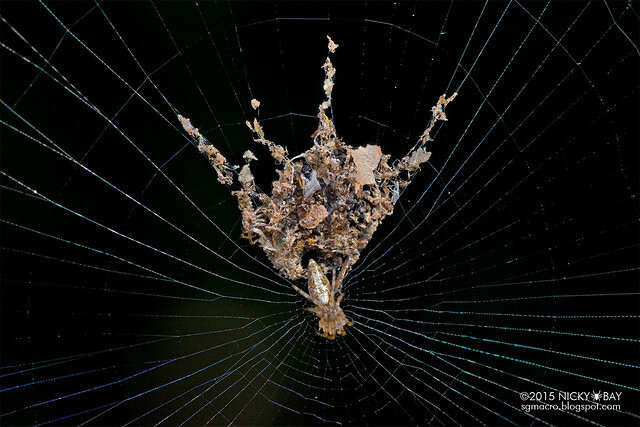 The detritus is built along the radiating lines of the spider's orb web, and more is collected in between. The radiating line of trash usually goes upwards, but it seems like this trait can vary a lot, and sometimes they resemble a larger spider. What is this decoy for? 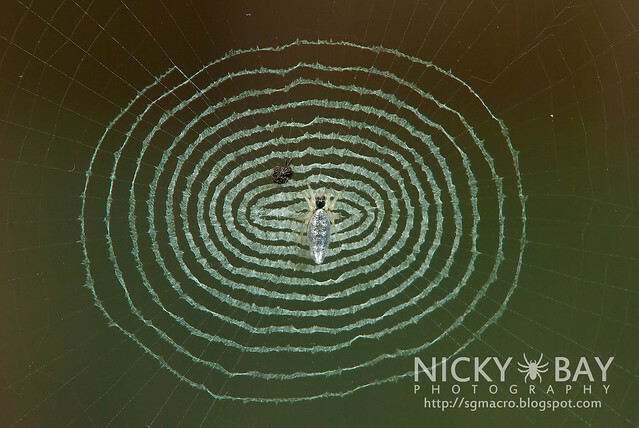 The reason for constructing these decoys is not certain, but there are many theories for creating these spidery illusions. Sounds logical to make oneself look bigger and more difficult to overcome. 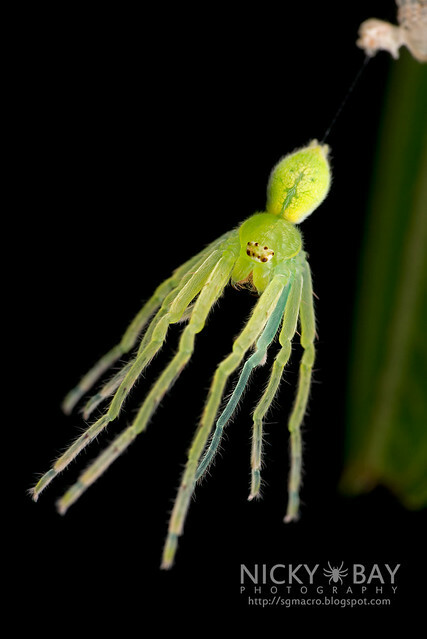 This has been observed in other genera such as Argiope, which builds a stabilimentum to extend its legs. Putting an obvious mark on the web makes it obvious to mammals that could easily destroy the web by walking into it. 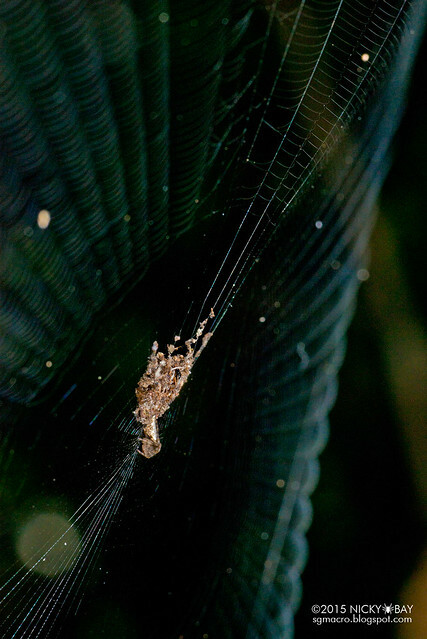 Since the trashline is partly built using the carcasses of the spider's prey, they might produce a scent that attracts others of the same kind. Free food for the spider! A similar theory was presented in a separate post for the ant-snatching assassin bug that carries the ant carcasses on its back. Currently a baseless theory. A larger trashline might just be able to increase the chances of attracting a mate! If the spider happens to be away, perhaps this fake sculpture of a spider wards off food-stealers (e.g. Argyrodes sp. ), like a scare crow? The actual location of the spider is not as obvious with so much trash on the web, fooling both potential predator and prey. At first, I thought the radiating trashlines were like the legs of a freshly moulted spider since they only radiated in one general direction. However, their legs are always pointing downwards while the trashlines are directed upwards more often than not. 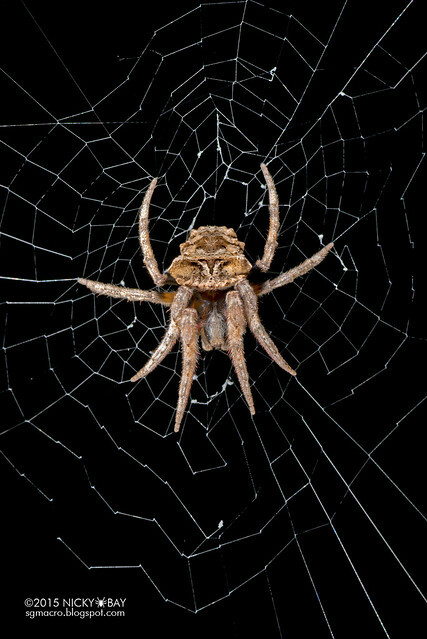 Then I realized that it simply resembles any larger orb web spider from the same family - they typically rest in the middle of the orb web with legs spread apart along the radiating lines of silk. Wider view from the other side of the web. The actual spider now looks much smaller and not even noticeable. View of the spider and its trashlines from the side. This is how a typical "trashline" looks like, with just a single line with the spider in the center. Notice that a gap breaking the trashline remains so that the spider can slot itself in comfortably to complete the trashline. Sometimes, the trashline only goes up in a single direction. I have never seen one that only goes down though. The trashline can also be very thick at times! In this case, the trashline could be the egg sac of the spider. Last but not least, is the one that creates an abstract masterpiece. Yes, it needs to be appreciated. The complete album for this field trip can be viewed on Flickr. 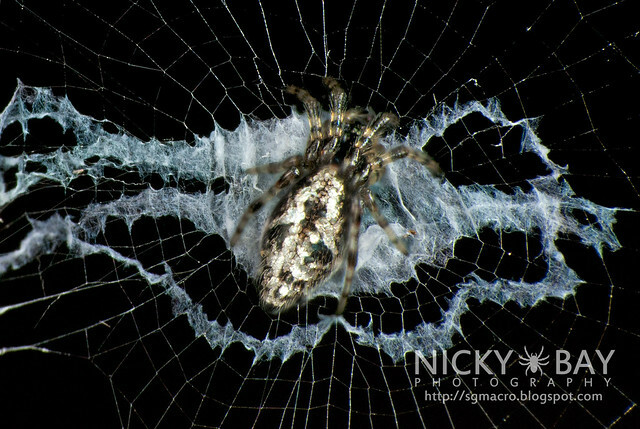 You can also view more photos of spiders from the genus Cyclosa here. Looking for more? Check the 2014 Macro Photography Highlights for the entire year's significant findings!